Available with plain sides and up to 4 gland plates. Gland plate thickness options 2.0 mm to 6.0 mm. Available as empty enclosures with ATEX component approval or fitted with a wide range of terminals and ATEX apparatus approval. Fitted with internal/external earth stud. 3 mm thick external wall mounting brackets. The top brackets are slotted for ease of mounting. Detachable hinged lid on ACEX231513 and above. 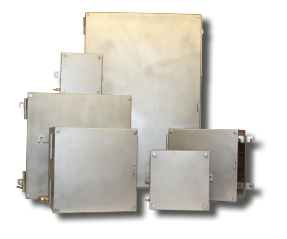 ACEX enclosures are manufactured from 316L stainless steel and available in 27 popular sizes ranging from 110x110x65mm to 1177x777x300mm with an orbital finish as standard or bead-blast or electro-polished finishes as options. ACEX are manufactured to the CEX specification technically but are equipped with standard hinges, hank bushes and a return flange, which allows water to drain away and provide a knife edge high grade seal. Gland plates, from 3mm to 6mm gauges, are available as an option on all sides. ACEX enclosures can be supplied with component approval, as empty enclosures, or apparatus approval as junction boxes fitted with a wide range of terminals. Available with ATEX 2014/34/EU Directive Ex e, Ex ia and Ex ib certification and a temperature classification of T5 or T6. ACEX are also available in fire-rated versions up to 970°C for 2 hours (to BS5839-1: 2013, Sec 26.2e) or 950°C for 3 hours to meet BS 6387 CWZ standards.